I recently learned that changing jobs can cause long gaps in blog postings. Now that I am settled into a new job I am back to getting my geek on. One of the new tricks I learned about is logmein.com (don't forget to type the "i" in that url). 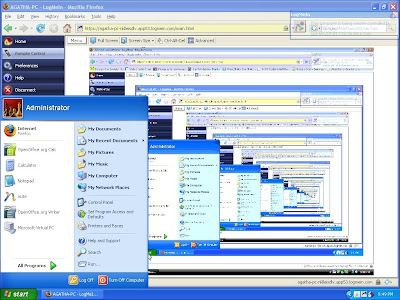 So of course on of the first things I had to do was logmein to a computer that was able to logmein back to the computer I was on. It gave me this neat mirror mirror effect and rendered my mouse cursor useless.